This year I will be participating in my 14th Pan-Mass Challenge. Over the past thirteen years, I have raised over $69,000 dollars for the Jimmy Fund and its mission of raising funds for adult and pediatric cancer care and research to improve the chances of survival for cancer patients around the world. The mission of the Pan-Mass to ride until we find a cure is something that resonated with me thirteen years ago when I first signed up, having lost family members to this horrible disease. However, the intensity changed a few years ago when I met a neighbor, Rich Nolan. When I first met Rich in the summer of 2010, he had been diagnosed with multiple myeloma a few years prior and was aggressively fighting the disease. When his wife Donna had heard that I rode in the Pan-Mass Challenge, she came over one morning (right after I had gone out for a training ride!) and introduced herself and told me about Rich. A bond immediately formed, and I was honored to ride for Rich that year. In 2011, while still undergoing treatment, Rich was determined to ride in his first PMC. While we were only able to get out for one short training ride, Rich still hopped on the saddle and together we rode the first 43 miles, to the Franklin water stop. PMC riders know that the first half of this ride is certainly the hilliest, and making it this far, with essentially no training beforehand, is a major accomplishment. 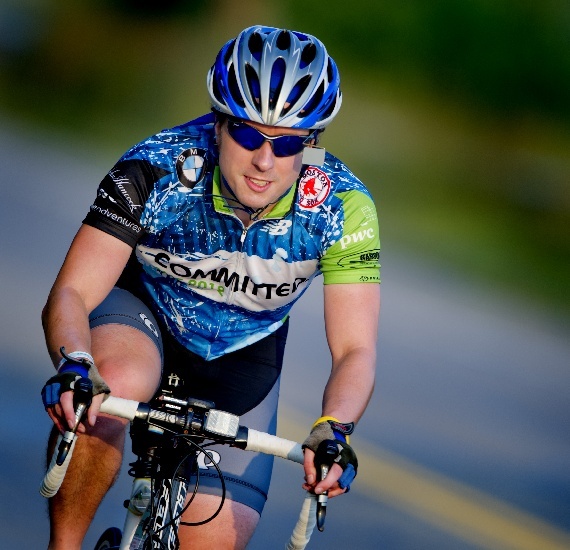 In 2012, Rich joined the Patriots Platelet Pedalers team as a virtual rider. This team rides in support of Dr. Ken Anderson, the Kraft Family Professor of Medicine at Harvard Medical School and Dana-Farber Cancer Institute, to support his multiple myeloma research and development of novel therapies. Rich was unable to physically ride that year, but he raised $3,765 for a cause he believed in so strongly. During the winter of 2013, Rich extended an offer to me to join his team. I eagerly accepted, having learned that the team supports researching Rich's type of cancer. Rich fought this cancer like a champion, undergoing a stem cell transplant, rounds of chemo and other medications, and a bone barrow transplant. Cancer took Rich's life on June 6th, 2013. Upon hearing of Rich's death, my daughter Sarah nailed it; she said to me, cancer is some kind of evil. 100% of every dollar of your sponsorship goes directly to supporting this important research. As long as there is hope that we can treat and someday eradicate this evil -- and there IS always hope -- I will continue to ride. This is my passion, this is why I ride.